Kelly Schreiner has been programming Ataris for approximately six years. He enjoys programming his 520 ST in both 68000 machine language and C, and is currently studying to become an electronic engineer. 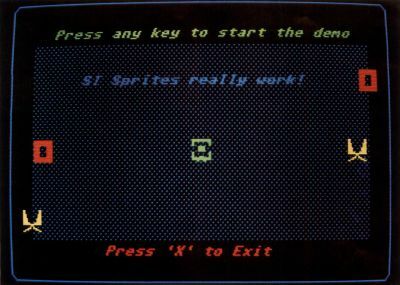 For those of you who grew up programming on the 8-bit Ataris as I did, ST sprite programming should be a fairly routine task, because the ST's sprites are analogous in many ways to the Player/Missile graphics we were accustomed to on the 8-bit machines. And for those of you that have never programmed either sprites or Player/Missile graphics, this is the perfect time to learn sprite programming for the ST computer. But first, let's make some comparisons between ST sprites and Player/Missile graphics, just so everybody knows what a sprite is to begin with. ST sprites and Player/Missile graphics are both user definable bit-block images stored in memory that can easily be moved around the screen independent of the background drawing. They both can have depth, (meaning that the first object drawn can pass in front of the second object, the second in front of the third and so on), and they both can have only one color. (Unless, of course, two or more objects of differing colors are overlayed on top of each other). Both Player/Missile graphics and ST sprites are commonly used in games for arcade-type action on their respective computers. Now that the similarities between ST sprites and Player/Missile graphics have been looked at, let's examine the differences between the two. One of the major differences between ST sprites and Player/Missile graphics is that the ST sprites are purely software-based sprites, not hardware-based, like Player/Missile graphics. The ST sprites are also limited in size; they measure 16 × 16 pixels instead of 8 pixels wide by either 1-128 or 1-256 pixels high for Player/Missile graphics. The ST sprites are considerably easier to create than Player/Missile graphics though, and you can have practically as many sprites in a program as you want compared to the four players along with their missiles that Player/Missile graphics offers. As I said earlier, sprite programming on the ST computer is a relatively easy task to accomplish. That is, once you know how! The main reason for this is the fact that most of the work related to sprite programming is already done for you in the Line A opcodes, $A00D (DRAW__SPRITE) and $A00C (UNDRAW__SPRITE). By using the DRAW__SPRITE opcode, ($A00D), the sprite's X/Y coordinates on the screen can be established along with the sprite to be seen and its associated background buffer. The background buffer is needed to temporarily store the background behind the sprite, so that when the UNDRAW__SPRITE opcode is called to erase the sprite, the background can be restored to its original condition, just like it was before the sprite was drawn over it. 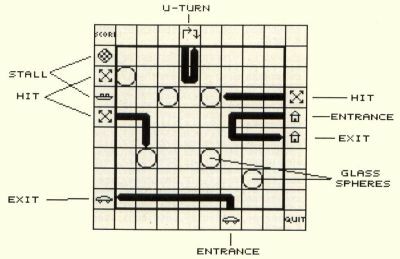 One of the most important things you need to understand to be able to program sprites on the ST computers is the use of the Line A opcodes. These opcodes are the very heart of the ST's powerful graphics capabilities. The software developers of the ST have made use of the fact that the 68000 processor used in the Atari ST computers has two groups of opcodes which it does not understand, and which consequently generate a software interrupt when encountered in a program. These opcodes begin at memory locations $Axxx and $Fxxx. The Atari ST uses the $Axxx opcode trap, referred to as the Line A Handler, to access its graphics routines. 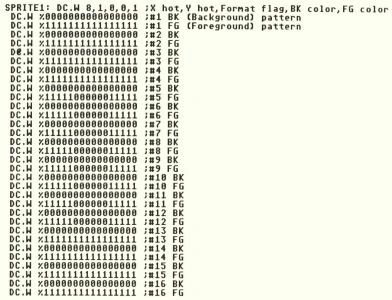 The trap handler that processes this trap recognizes word opcodes that begin with the bits 1010 (hexadecimal A) as unimplemented instructions and then jumps through a special exception vector, which in the ST's case points to the Line A routines. The lower four bits of the word opcode used contain the number of the routine to be accessed. Only values between $0 and $E are allowed here. That means that a total of 15 different opcodes are available for the Line A graphics routines. This number includes the initialization opcode, though, so there are actually only 14 graphics routines. In this demo program only the word opcodes $A000, $A00C, and $A00D are used, so I will confine myself to describing those. In order to use the Line A opcodes you must first label the word opcode functions you want to use in your program. Here is the way these functions are labeled in the demo program SPRITES. The next step is for you to initialize the Line A routines for use in the program. The opcode $A000, Initialize, is used to do this; it determines the address of the Line A routines. After calling this function, data register D0 and address register A0 point to a table with the starting address of the Line A variables. Address register A1 points to a table with the starting addresses for the three system font headers, and address register A2 points to a table that specifies the starting addresses of the 15 Line A opcodes. There's no parameter required for this function, so all you have to do is call the word opcode label that you specified for the $A000 (Initialize) function. In order to draw a sprite onto the screen there are three things that need to be discussed. These are the DRAW__SPRITE opcode, the sprite definition block, and the sprite's background buffer. We will look at each of these structures individually. 0 0 The background (BK) appears. 0 1 The color in Word 4 appears. 1 0 The color in Word 5 appears. 1 1 The color in Word 5 appears. 1 0 The pixel on the screen is XORed with the foreground (FG) bits of the sprite. Now that we know how to put a sprite on the screen, we must be able to save the backgound behind the sprite so it can be put back once the sprite is moved. The sprite background buffer as mentioned earlier in this article does that very thing; it holds the background behind the sprite, so that when you move the sprite, the background beneath it can be restored to its original condition. This buffer must be 74 bytes long for high resolution, 138 bytes long for medium resolution, and 266 bytes long for low resolution. The difference is caused by the number of bit planes involved for the different screen resolutions. In low resolution the ST's screen needs a total of four bit planes to display the 16 colors normally available at any given time in that mode. The medium-resolution screen requires only two-bit planes to display the four colors available in that mode, while the high-resolution screen needs only a one-bit plane to display the monochrome image it produces. The formula used to determine the buffer length needed is N*64 + 10 where N is the number of bit planes. Once you know how a sprite is displayed on the screen and how to save into a buffer its background for later use, all that's left to learn is how to use that buffer to restore the background behind the sprite to its original condition. The routine used for this function is the Line A opcode $A00C, UNDRAW_SPRITE. This opcode has only one parameter. It is called simply by loading the effective address of the appropriate sprite's background buffer back into address register A2. You then call the UNDRAW_SPRITE function by the word opcode label that you defined earlier in the program. ERASE_SPRITE pointer to the sprite's background buffer. The macro definitions themselves look as shown in Figure 1. These macros are optional. If you don't have a macro assembler like AssemPro or its equivalent then you will have to use the coding discussed earlier in this article. The demo program SPRITES is set up to use the low-resolution screen of the ST, although it will work in medium resolution. The program starts by drawing three stationary sprites of differing colors in the middle of the screen and two movable sprites in opposite corners of the screen. A prompt will then appear asking you to press any key to start the demo. After pressing a key, the two moveable sprites will begin to travel smoothly across the screen in opposite directions. They will continue to loop like that for about two minutes, and then you will be asked to press "X" to exit the program.